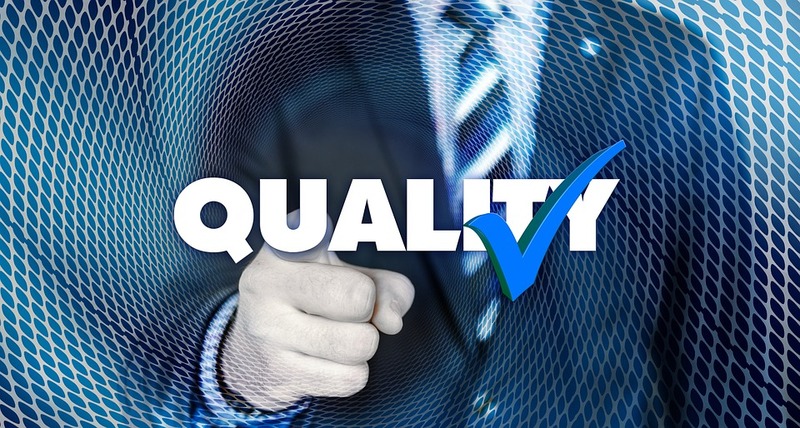 The main difference between quality control and quality assurance is that quality control is the process of carrying out activities to ensure the quality in the software product while quality assurance is the process of carrying out activities to ensure the quality in the software engineering processes. Enterprise level software development is a difficult task. The first step of developing the software is requirement gathering. The final software product should satisfy these defined requirements. Moreover, it is necessary to ensure the quality of the final software. Software quality is the degree in which the system, component or a process meets the specified requirements. Quality control and quality assurance are two main components in the quality management of software. Thus, there is a distinct difference between quality control and quality assurance. Quality management consists of four major components. They are quality planning, quality assurance, quality control and quality improvement. Quality Control is the process of carrying out activities to ensure quality in the software product. These activities focus on identifying defects in the actual product. Moreover, software quality control is entirely governed by software quality assurance. There are various activities involved in quality control. Inspections and walkthroughs are one of them. It is also possible to consider design reviews, code reviews, test plan and test case reviews. Moreover, one major activity under quality control is testing, which is the process of verifying and validating that the software product is working as expected. Software quality assurance is the process of carrying out activities to ensure that quality in the software engineering processes. It ultimately results in producing a quality software product at the end. Software processes describe developing the software from scratch or modifying the entire system. Software engineering processes include software development methodology, product management, configuration management, estimation, software design, etc. After defining and implementing processes, quality assurance helps to identify weaknesses in the processes and to correct them to improve the processes. Furthermore, quality assurance encompasses the entire software development lifecycle. Process defining and implementation, auditing, and, training are some activities related to quality assurance. Software Quality Control relies on Software Quality Assurance. Software quality control is the set of procedures used by organizations to ensure that a software product will meet its quality goals at the best value to the customer. Conversely, software quality assurance is the process of monitoring the software engineering processes and methods used to ensure the quality of the software product. Thus, the main difference between quality control and quality assurance is the main focus. Quality control tries to find defects and fix them while developing the product; therefore, quality control is about detection. Quality assurance tries to prevent defects; therefore, quality assurance is about prevention. The goal of quality control is to identify the defects after a software product is developed, but is still not released or still in the production stage. The goal of quality assurance is to develop a process so that defects do not arise when producing the software product. Hence, this is another difference between quality control and quality assurance. Quality control involves activities such as reviews, inspections, walkthroughs and testing. Quality assurance involves activities such as process definition, implementation, auditing and training. Quality control and quality assurance are two components of quality management. 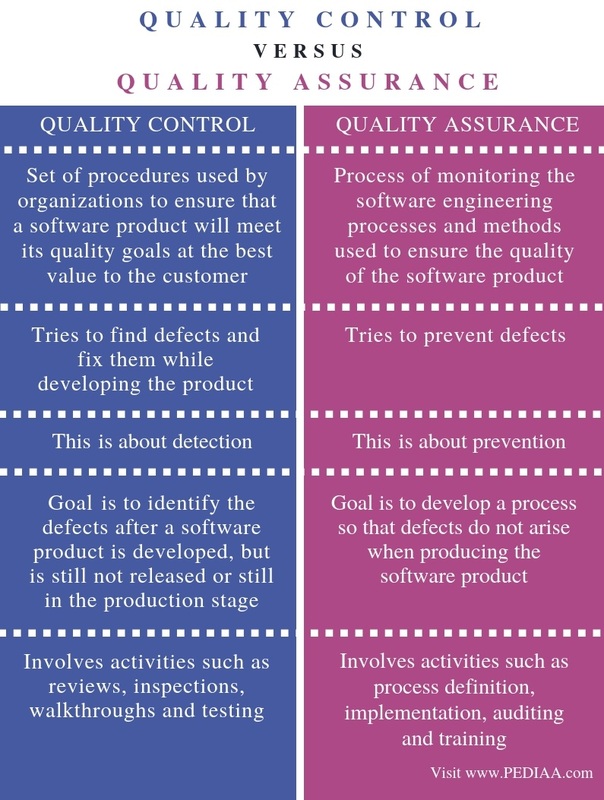 The basic difference between quality control and quality assurance is that quality control is the process of carrying out activities to ensure the quality in the software product while quality assurance is the process of carrying out activities to ensure the quality in the software engineering processes. 1. “Software Quality Control”, Software Testing Fundamentals, 3 Mar. 2018, Available here. 2. “Software Quality Assurance”, Software Testing Fundamentals, 3 Mar. 2018, Available here.